We made this bird feeder after seeing it on Frogs, Snails and Puppy Dog Tails and pinning it to our 5 Days of Play pin board. It seems like a perfect time to post about it now as Im taking part in the Children Loving Animals blog hop - you can read all about it here at the wonderful AngeliqueFelix.com. I had lots of animals growing up, and loved them all; from the little guinea pigs to the big horses! :) Having animals taught me a lot about responsibility, empathy, kindness and respect. I really want Jake and Poppy to have similar experiences but currently we rent our cottage and we are not allowed any pets, aside from our fish. However, our neighbour has a very friendly cat, there are rabbits in the garden, and horses everywhere. We also have a lot of natural wildlife around us, like butterflies, lizards and birds, that we love spotting outside our house and on walks. 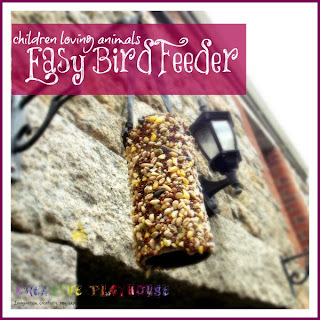 So planting friendly flowers and plants and hanging bird feeders is a small way that we can engage with animals without having pets. 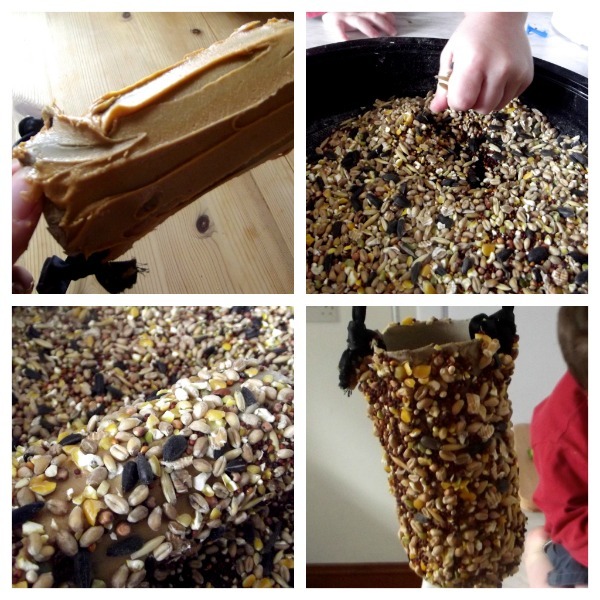 To make this bird feeder you just need a toilet roll, some peanut butter and some bird seed, and something like string or ribbon to hang it up. Secure the ribbon or string onto the toilet roll so it can be hung up outside, then spread peanut butter all over the toilet roll, then roll it in the seeds, and hang it up! Easy! Jake likes looking each day to see how much has been eaten, and although we haven't actually seen a bird on the feeder, we have seen lots flitting around our house and garden. Pinning this on my Recycle board. 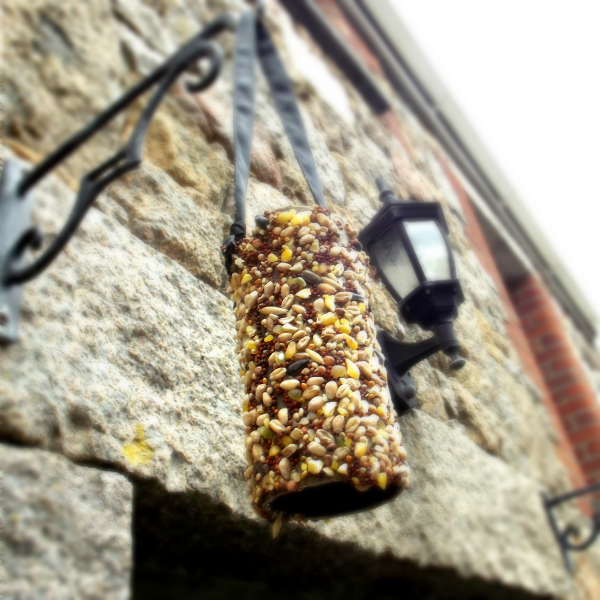 Love the simplicity of it - yet so helpful to birds. I'd like to use a photo from this post for my ABC's list of Thrifty Teaching Tools the first week of January. I'd put a link under the photo to this post. Hoping that is all right with you. Thank you.